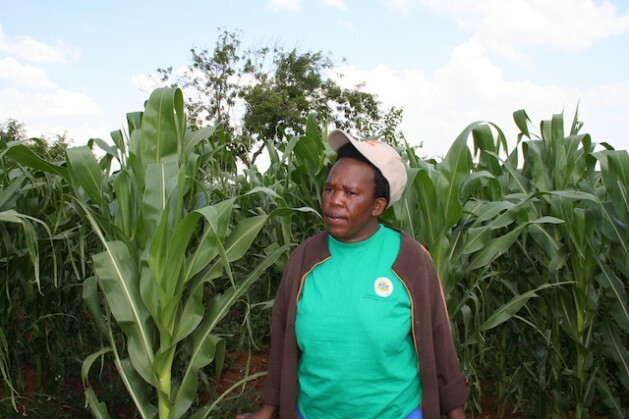 MASOPANE, South Africa, Jan 27 2014 (IPS) - On a family farm tucked between the rolling hills of Masopane, 40 km outside of South Africa’s capital, Pretoria, 35-year-old Sophie Mabhena is dreaming big about her crop of genetically modified (GM) maize. “This is my dream and I know that I am contributing to food security in South Africa,” she told IPS. Debate is raging here over the government’s policy to promote the cultivation of GM crops. This month, South Africa launched a new bio-economy strategy, which the government says will boost public access to food security, better health care, jobs and environmental protection. SOUTH AFRICA: GMOs – Strategic Priority in Whose Interest? The new policy promotes multi-sector partnerships and increased public awareness on the benefits of biotechnology – including the use of GM crops. Mabhena is growing GM maize on part of her family’s 385-hectare Onverwaght Farm because she says the transgenic maize has saved her 218 dollars a season in dealing with pests and weeds. “Growing stack maize has reduced my costs in terms of pesticides and labour, but the major benefits are the good yields and income from growing this improved variety of maize,” Mabhena said from Onverwaght Farm where, this season, she expects to harvest up to seven tonnes of maize per hectare. In-built insect resistance (Bt) maize has been grown in South Africa for the last 15 years, but not without opposition from anti-GM activists. The benefits of GM maize that Mabhena speaks of are not shared by Haidee Swanby, research and outreach officer at the Africa Centre for Biosafety (ACB), which has been on the forefront of spirited campaigns against GM food in South Africa. Swanby said that GM technology fits into a concentrated farming system, which requires large volumes based on economies of scale, but does not provide livelihoods or healthy, accessible food for ordinary South Africans. “We need to take a step back and look at our food system in its entirety and decide what system is equitable, environmentally sound and will provide nutritious food for all,” Swanby told IPS. A 2012 study by Seralini and his research team linked GM maize to cancer. The study has since been dismissed for failing to meet scientific standards by the European Food Safety Authority, a body responsible for reviewing the use and authorisation of GMOs. ACB’s recent report, “Africa Bullied to Grow Defective Bt Maize: The Failure of Monsanto’s MON810 Maize in South Africa”, states that Monsanto’s Bt maize failed hopelessly in South Africa as a result of massive insect resistance only 15 years after its introduction into commercial agriculture. “Today, 24 percent of South Africans go to bed hungry … but the biotech industry has habitually used yield as an indicator of success and this is too narrow and very misleading,” Swanby said. The ACB argues that the safety of stacking genes is a new area of science whose long-term sustainability remained questionable and states that Bt technology was approved in South Africa before regulatory authorities had the capacity to properly regulate it. But Dr. Nompumelelo Obokoh, chief executive officer of AfricaBio, a biotechnology association based in Pretoria, told IPS that the GMO Act was passed in 1997 and before then GM crops were regulated under the Agricultural Pests Act. “Farmers are business people. If it is so difficult or unprofitable to grow Bt maize why is almost 90 percent of our maize based on biotechnology? Surely, if South African farmers found GM maize so difficult to manage why haven’t they rushed back to the old maize varieties of the past?” asked Obokoh. In 2011 and 2012, 2.3 million hectares and 2.9 million hectares, respectively, of GM crops were grown in South Africa by both small-scale and commercial farmers. “The GMO advocates have also promoted the myth that crop productivity, by itself, can eradicate hunger,” said Smith, arguing that key international reports over the last 15 years describe how economics and distribution are more fundamental to solving this problem. However, in November the African Science Academies urged African governments to invest heavily on biotechnology, declaring that biotechnology-enhanced tools and products can help Africa break the cycle of hunger, malnutrition and underdevelopment. SA is being very short-sighted here. It is alarming that research money is being spent on this and not on more sustainable technique, especially with water shortage. Obokah is wrong in saying that gmo’s do not compete – perhaps not against conventional farming, but the future lies in alternative farming, and new options, better ways of using scarcer and scarcer resources. Monocrop farming is the least sustainable model for long term, and also pollutes water supplies. I read recently an article about how monocrop farming destroys the insects that many people in the world eat and enjoy, and that is the highest protein in the human diet. When cultures lose their own traditional cultural foods, they weaken. More people in the world want a heavier meat diet now, as they become more affluent, because it is promoted as higher class etc. But in times of need, the meat is not around, the insects usually are. The west has to change its habits, not export them unsustainably to other countries. As for the African Science Academies — follow the money — it is quite discernible whose interests they are promoting, and it is not that of the average African citizen or subsistence farmer, who wants to stay on their land. Your comments seem to then be focussed on the approaches to farming and not GMOs. Genetic modification is a tool that can also be used in many other farming systems including more integrated farming practices. Haidee also criticises current agricultural practices but looking at the ACB website other than paying lip-service they do not offer workable alternatives. And yes I do think more work is necessary on alternative systems especially with small scale farmers and government and academia is working on such systems.